LAUGHTER may be the best medicine, but comedian Phil Cool admits that when he was in hospital recovering from heart bypass surgery he found it difficult to summon up his sense of humour. The 63-year-old, whose real name is Phil Martin, explains: “I just did not have the energy to muster up any humour. “I just wanted to save any energy I had into getting better. “However, as I started getting better, I did have some cheeky thoughts while in hospital. Phil, who lives in Thornley, near Longridge, underwent a quadruple heart bypass at Blackpool Victoria Hospital in April, more than 10 years after first becoming aware he had a heart problem. Phil, who is married to Beverley, and has a son, Joe, and three grandchildren, recalls: “It was in the year 2000, and I woke up in the middle of the night with terrible pains in my back, and I felt really ill and was sick. Phil was in hospital for eight days while heart specialists carried out tests, and an angiogram showed that one of the arteries leading to his heart was 65% blocked. However, Phil was told that he did not need surgery at that point, as his condition was not life-threatening, and that regular exercise should bring about an improvement. Phil says: “My wife had always wanted a dog, so she bought a springer spaniel, who we named Dylan, and I would take him for strenuous walks and go up hills with him. But as time went on, Phil’s warm-up angina began getting worse and, about a year ago, he started suffering from a bit of angina, even when he was not doing anything, so he mentioned it to his consultant at Royal Preston. Another angiogram was performed, which revealed Phil’s arteries were slightly narrower than they were before, and the specialist advised Phil to see a heart surgeon. Phil says: “I did not relish the thought, as I am quite squeamish and queasy about things like that. “I cannot even watch surgery on television, and always have to switch over if anything medical or gory comes on. “But when I met the heart surgeon, Russell Milner, at Blackpool Victoria Hospital, I felt confident, as he looked the part and seemed intelligent. “When I went in for the heart surgery, I just willed myself into a state of mind and told myself I had to put my trust in the surgeon. Phil had a quadruple heart bypass, and veins were taken out of his legs and put in his heart. Phil says: “It was awful for the first couple of days after the surgery, as I was just in so much pain and could not get comfortable lying down. “But I was really impressed with the care I received, and I left the hospital a present of ‘before’ and ‘after’ pictures of me, and pulled a really horrendous face in the before photo. 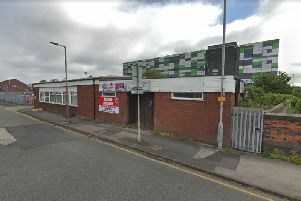 After suffering his first heart incident in 2000, Phil had been put in touch with the charity Heartbeat, based on Garstang Road, Preston, which helps people rehabilitate after heart surgery. He exercised there for two-and-a-half years under supervision, before deciding to join a gym near his home. After his heart bypass, it was suggested that Phil should go back to Heartbeat, and he now goes there twice a week for a one-hour exercise class. Phil says: “I do cardiovascular exercise with the cross trainers, running track, bikes and stepping machines, and it is all under supervision, so you are secure in the knowledge that someone is watching you. Phil considers himself extremely lucky, as he has lost a number of family members to heart disease. His dad, Thomas Martin, died of a heart attack at the age of 54, and his mum, Clara, died 13 years later of a heart attack when she was 69. And Phil lost his brother, James, to a heart attack at the age of 42. Phil says: “Unlike the others, I had a pre-warning of my heart problem, so I had regular check-ups and had the surgery as soon as it became clear I needed it. l Heartbeat supports people of all ages living with the devastating effects of heart disease and helps them rebuild their lives through exercise, rehabilitation, advice and support. For more information on Heartbeat, call 01772 717147.